Refinancing offers a variety of possibilities for a real estate investor. You can extend the length of your loan, lower your monthly interest payments, or even pull cash out to put towards the purchase of another investment property or to fix a buy and hold property to be in better condition. Regardless of why you choose to refinance, there is no denying the benefit of it. 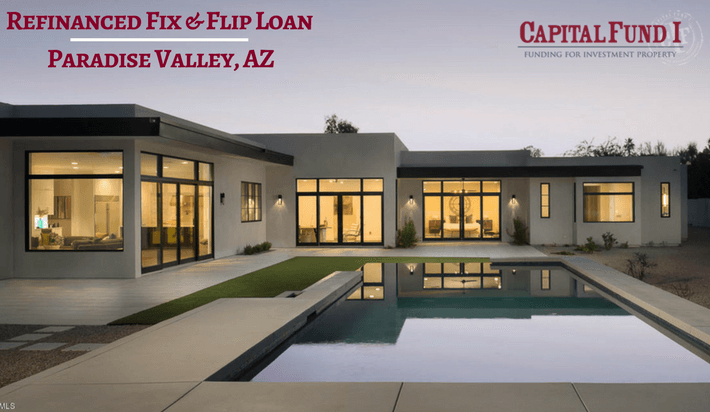 On this fix and flip home, the borrower had already completed the “fix” part and has it on the market just waiting to flip, but their previous lender had some tall orders for them to extend their loan, so instead they chose to refinance with Capital Fund 1. This new borrower had completed the finishing touches on this piece of luxury real estate and had listed it on the MLS. Knowing that the luxury market is currently slow, the borrower looked to their current hard money lender at the time to provide an extension on their property, giving them more time to market the property and sell it within that time limit. Lucky for them, their lender was willing to extend. Not so lucky for them, their lender was requiring a paydown of their loan in order to extend, and they weren’t ready to let go of some of their leverage. Just like many real estate investors experience, there are sometimes unplanned expenses that eat away at a budget, and that’s exactly what happened with this borrower. Wanting to still keep some cash on hand, the borrower didn’t want to let go of the leverage they did have and started looking for a private money lender to refinance their fix and flip. We were able to work with the borrower and created some loan terms that worked for them, giving them the “extension” they needed, without a large paydown on the property. This will give them more time to put towards marketing and eventually selling the fix and flip property. Though we assisted our borrower’s request by allowing the borrower to leverage themselves better, Capital Fund 1 has also assisted other borrowers by providing refinances on short term investment property loans. In some cases we’ve assisted buy and hold owners with getting the financing to fix a roof or series of larger fixes by providing a cash out refinance, or for fix and flips and construction loans we’ve been able to help our borrowers lower their monthly payments by refinancing into a new loan. Ready to refinance? Call Capital Fund 1, LLC to get started on yours today.